Geert Wilders's Party for Freedom did worse than expected on Wednesday. But there's not much else to cheer in Dutch politics. The Netherlands woke up the day after its elections to exceptionally warm weather, announcing the start of spring. But the high-strung commentary from the international media and assorted heads of state made it seem like the country had jumped straight from winter to summer. For months, opinion polls projected that the Netherlands would be the next country to experience a far-right victory. The fact that Geert Wilders’s Party for Freedom (PVV) finished second, then, could be spun as a win for politically moderate forces. But the Left cannot be so complacent. The election results, hailed by liberal commentators as a success for the center, in fact mark a dual victory for the far right. First of all, the PVV won in purely numerical terms. 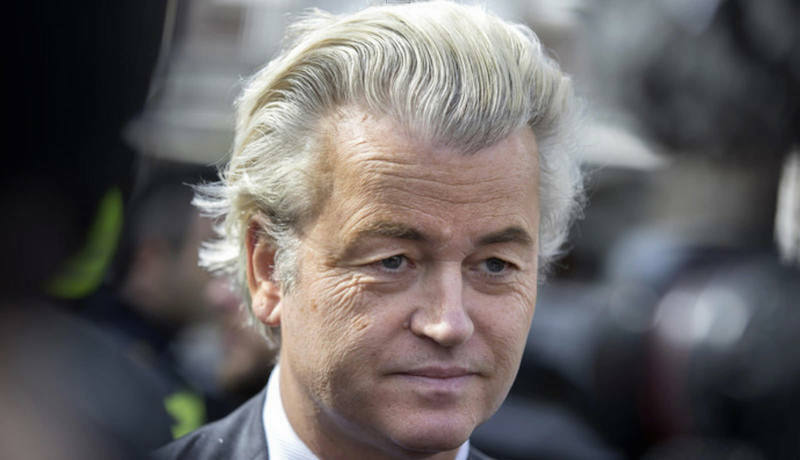 Wilders managed to increase his vote to thirteen percent, giving him twenty of one hundred fifty parliamentary seats. Meanwhile, the two government parties — the free-market conservative People’s Party for Freedom and Democracy (VVD) and the center-left Labour Party (PvdA) lost significantly. The VVD went from forty-one to thirty-three seats; despite the loss, it remains the biggest party in a thoroughly fragmented parliament that is split between thirteen parties. The Labour Party suffered a historic humiliation. It lost twenty-nine seats, bringing its current total to just nine. To the PVV’s five seats, we should add the two seats claimed by the new Forum for Democracy — the Netherlands’ answer to the United States’ alt-right. During the campaign, party leader Thierry Baudet called for ending the “homeopathic dilution of the Dutch people” by foreigners. He has also claimed in his writings that all women secretly long to be raped. Apart from these numerical gains, the far right managed to set the agenda for the entire campaign season. Both the VVD and the Christian Democratic Appeal (CDA), which ended at nineteen seats, waged a more explicitly racist and Islamophobic campaign than ever before. Prime Minister Mark Rutt suggested that migrants (or their children, or their grandchildren) should “piss off” to their countries of origin if they refused to follow Dutch values, or as he put it, “act normal.” A VVD billboard described the hijab as a “head rag,” a phrase Wilders coined. Leaving aside the question of Christianity’s historical track record, it is safe to say that the CDA and its predecessors have not exactly been at the forefront of the struggle for women’s liberation over the past century. These alleged moderates’ willingness to turn Wilders’s rhetoric into actual policy was underlined in the days before the election, when the Dutch and Turkish governments stoked a serious diplomatic riot for their own nationalist interests. In this context, perhaps the most revealing remark on election night came from Rutte, who repeatedly insisted that the electorate had rejected “the wrong kind of populism.” His implicit endorsement of “the right kind of populism” is by no means an accident: he and Halbe Zijlstra, the leader of the VVD’s parliamentary faction, have systematically steered their party closer and closer to the PVV’s racist line. Thus, Wilders gained both numbers and political influence. He lost only in comparison to the even larger gains granted to him in the virtual reality the polling agencies created. This demands an important aside, for in recent years such opinion polls themselves have become a major force in politics. Suppose the worst polls had come true, and the PVV had indeed beaten the VVD to first place. As horrific as it would have been, Wilders’s party would probably not have reached the 20 percent that Rutte’s party did. But the rhetoric matters more than the numbers. Describing those who vote for the far right as the “true voice of the people” has political merits even for the establishment. It justifies moving further to the right and delegitimizes even the most moderate left-wing agendas. But this is a double-edged sword, as it also boosts the far right’s credentials. Fifteen years ago, when the Dutch Islamophobe politician Pim Fortuyn was shot, many shrugged off his movement’s electoral success as an anomaly. Today, the PVV represents a steady political force, often setting the tone for the national political debate. Street organizations on its fringes, like the Dutch branch of Pegida, organize protests with burning torches outside refugee centers. Wilders’s party’s successes have left a rise in violent attacks on mosques and migrants in their wake. The PVV did not have to become the largest party to present a danger: it has been one for a decade already. If the PVV’s steady growth does not represent a sharp political rupture, the Dutch Labour Party’s complete collapse certainly does. The last fifteen years have taken a toll on what was once, for better or worse, the political center of gravity for the entire working class movement. Since 2002, the PvdA has risen and fallen again. It went from a historically low twenty-three seats in 2002 — the year of Fortuyn’s murder — to forty-two seats a year later. After several electoral defeats, it bounced back to thirty seats in 2010 and picked up eight more in 2012. Its drop to nine seats — reflecting a mere 5.7 percent of the vote — is unprecedented in Dutch parliamentary history. The rot goes deeper: the PvdA did not come in first in a single municipality, ranking fourth in Amsterdam and fifth in places like Zaanstad and Groningen, once cradles of the Dutch socialist movement. In working-class Rotterdam, still Europe’s largest harbor and a city where social democracy once was completely hegemonic, the PvdA came in seventh. The PvdA might regain its lost electoral ground at some point. Examples from around Europe show that, like the Dybbuk of ancient Yiddish legend, the dead soul of traditional social democracy finds ever-new vehicles to walk among the living. But the Labour Party will never recover its solid working-class base. Since the mid-eighties, the PvdA — like its counterparts across Europe — has been instrumental in introducing neoliberal policies. Throughout the 1990s and early 2000s, it helped reign in social provisions and allowed for the privatization of railways, the postal service, and health insurance, among others. Under the current government, the PvdA’s rightward shift took on a whole new meaning. The party gained significant ground during the 2012 elections by arguing that a vote for Labour was the only way to avoid a VVD-led austerity government. Immediately after the elections, the party turned around and started negotiating the formation of a coalition with those very opponents. This government launched a massive austerity program, entailing almost fifty billion euros in cutbacks. PvdA ministers prided themselves on taking some of the most difficult posts, including social affairs and employment (PvdA leader Lodewijk Asscher) and finance (Jeroen Dijsselbloem). A PvdA minister of the interior loyally executed the VVD’s anti-refugee policies. And Dijsselbloem not only enthusiastically applied the European Union’s fiscal stringency to the Netherlands but, as chairman of the Eurogroup, became its main enforcer against the Syriza government. Does this mean that the center cannot hold, as so many have said in response to the current political cycle? The Dutch election’s results do not bear this out, and the international left should pay attention. The same anger and anxieties that created violent shocks to the political system — of which the PvdA’s collapse is only the latest example — also continue to drive large numbers to vote for allegedly safe parties that they wrongly believe will at least not make things worse. In fact, the VVD’s and the PvdA’s losses were at least partly compensated by the CDA’s and D66’s gains (from thirteen to nineteen seats and from twelve to nineteen seats, respectively). These parties are as fully committed to neoliberal policies as the VVD and the PvdA. And the big surprise winner of the elections, Jesse Klaver of GroenLinks (GL), campaigned on the basis of not only being “the need for change,” but also a “responsible and trustworthy” political partner in a future coalition government, explicitly presenting himself as a reliable center-left candidate. Compared to politics during the half-century after World War II, the political center has become much more fragmented. But it has not collapsed, and is not at the brink of doing so. What today’s elections do show is that staying in the center no longer guarantees stability: centrist parties bounce up and down violently from election to election. But parties on the two political flanks don’t necessarily benefit from this unstable center. Without social explosions that fundamentally reshuffle the existing structures of party politics, the parties that gain the most from this crisis of the center are, as often as not, other centrist formations. One of the main reasons why the political center has been able to maintain itself has been the structural inability of the Dutch left to build a viable alternative. The Labour Party and GL do not even see it as their mission to provide such a challenge. The Socialist Party (SP) does, but it has not managed to gain from the historic collapse of the PvdA. Combined, the three big parties of the left lost twenty seats, winning only thirty-seven. For the first time, the PvdA came in third among these three. The SP more or less stood its ground (fourteen seats, down from fifteen), while Trudeau look-alike Jesse Klaver managed to bring GL from four to fourteen seats. Although Klaver’s success has been met with considerable enthusiasm both in- and outside the Netherlands, his claim to lead the left rings hollow. In the mid-eighties, GL formed through the merger of a number of smaller left-wing parties, including the Dutch Communist Party. At first, it was connected to the emerging anti-war and ecological movements, but the party made a historic right turn in the late 1990s, embracing social liberalism and supporting military intervention in both Serbia and Afghanistan. Klaver became a party leader amid the debate over higher-education cutbacks, during which GL actively campaigned for abolishing student stipends. The party’s decision to run a campaign for change came out of discussions with spin doctors from the American Democratic Party. They advised Klaver to roll up his sleeves Trudeau-style and talk like Obama. In one case, Klaver took them literally and plagiarized entire sections of an Obama speech. Of course, redemption is possible even on the left. But GL’s leftward turn came without any substantial discussion, moment of reckoning, or break with the past. Klaver launched his campaign surrounded by the applauding party leaders of the last fifteen years. When asked directly, he consistently refused to rule out joining a coalition government with the VVD. Still, many voted for GL out of a sincere desire for change. The party’s ability to project an image of youthful opposition to the Right was mainly made possible by the absence of the real thing. For that, the SP bears great responsibility. In contrast to GL, the SP has consistently opposed neoliberal policies on the national level and enjoys considerable support from the labor left. It demonstrated against the wars in Afghanistan and Iraq and built a large street campaign last year against privatized health insurance. However, its overall visibility in protests has decreased significantly in the last decade. The party’s obsession with replacing the PvdA and becoming fit for government has weakened its activist wing. In Amsterdam, it joined a local government with the VVD, a pattern it has repeated in other cities. Nationally, this outlook was translated into the preposterous slogan “Take Power.” When it became clear that the Socialists would once again perform below their own expectations, they silently ditched the tagline. But the SP campaign had another crucial shortcoming. Due to its primarily workerist perspective, the party has combined its commitment to a traditional social-democratic platform with many concessions to racism and nationalism. For example, its campaigns against the European Union have always concentrated on the “loss of national sovereignty for the Dutch” rather that decrying the EU’s neoliberalism and militarism. Even more problematic has been the party’s continuous refusal to directly challenge the far right. During a campaign that largely revolved around the attacks Wilders launched on immigrants and Muslims, the SP adopted one of three responses: remaining silent, making vague claims about the need to “live together,” or, most damningly, going along with the attacks. For many, the absolute low point came when the party’s number three Lilian Marijnissen called Trump’s victory “refreshing.” While later excused as a slip of the tongue, remarks like this from leading SP members became too common to ignore. And they cost the party dearly. For years, the party’s electoral strategy focused on winning over the PvdA’s base. With this base finally up for grabs, the SP couldn’t gain a single seat. In contrast to the global pattern, the Socialists are less popular among young voters than among the old. According to a post-election opinion poll, over a third of GL voters were under thirty-five, while less than sixteen percent of this demographic support the SP. Of the major parties, only the PvdA found less support among young people. All these points show that the Dutch left is in crisis. But, just as complacency over the PVV’s second-place finish is leading some to seriously underestimate the far right’s danger, so could the Left be lulled to sleep by Klaver’s superficial success and the SP’s ability to mitigate its losses. The elections revealed a level of fragmentation in the radical left that will be hard for people outside the Netherlands to understand. The ecologist Party of Animals gained three seats and now holds five. Thinking Netherlands, a migrant party that split from the PvdA, won three seats as well. This party has a strong antiracist platform but is thoroughly neoliberal, and its leaders have dubious ties to the Erdoğan regime. A split within this split, called Artikel 1, provided a glimmer of hope for those who want real renewal on the Left. It combined a strong antiracist platform with street activism on a range of emancipatory issues. The party won 2.7 percent of the vote in Amsterdam, but having been established only months before the election, it did not win a single parliamentary seat. Still, there is yearning for a fight. The Saturday before the elections, Amsterdam was the scene of a Women’s March against Trump and Wilders. Although none of the official leftist organizations called it, twenty thousand people showed up, making it one of the biggest leftist demonstrations in the last few years. Young women, people of color, and LGBT activists dominated the protest. A large delegation of the trade union of domestic workers also attended. The slogans were militant, feminist, anticapitalist, and political. Many went home planning to vote for GL or to give the SP the benefit of the doubt one last time. Others cheered the large group of Artikel 1 candidates who marched with them. Still others have veered from one position to the other and back again. If the radical left wants to overcome this fragmentation and provide a real basis to galvanize Dutch politics, it must combine the SP’s anti-neoliberalism with the vibrancy, militancy, and antiracism present at that march. Given the mainstream left parties’ strength and conservatism, the road to such a recombination will surely be difficult. But the election results do not grant the Dutch left the luxury to let this crisis continue to simmer. Pepijn Brandon is a Dutch historian who currently works at the University of Pittsburgh. Geert Wilders’s Party for Freedom did worse than expected on Wednesday. But there’s not much else to cheer in Dutch politics.